“I was only out of my room for two minutes, I swear it. But when I got back, there she was. Lying on my duvet, crying her head off. When a baby turns up in her room Shelley believes she may have gone mad, this is confirmed when she realises only she can see said baby but it can throw things, knock stuff off shelves and hit people, all the while everyone around thinking it wasShelley herself. Shelley knows she cant just ignore the baby and walk away and with her mum off in cloud cuckoo land since Scott the Toadstool left last weekend, Shelley knows she can’t turn to her for help either. Maybe Celeste, the baby, will actually help Shelley make her mum look at her properly for the first time in forever though, maybe she can stop her mum from being so distracted, and make all of Shelley’s dreams come true. Little Celeste was adorable and so, so cute, I just don’t know where to start! The story really was lovely but also a little sad. Celeste is a baby only Shelley can see and it was fairly obvious to me early on what Celeste was. Shelley is going through a tough time and things are all changing, her best friends left her, she has no one and she’s starting a new school at the end of summer. Top this off with her mum being ever more disinterested in her life over the last few years, with Scott around, and now he’s gone turning into a total wreck; of course Shelley is going to feel stressed and crazy. This book is an example of the things that kind of drastic change can bring about on a person and it was really sad, yet sweet, to read. Its a very short book at around 200 pages, with a very story-like narrative voice which makes you feel you are there, being told what is going on by Shelley herself. I loved the flow or the narration and how it gets you inside Shelley’s head but with large text and the conversational tone it really made for a quick easy read. I don’t mind this at all and of course the book is aimed at a much younger audience than a lot of my books, the kind of 10/11 range, and I do think that a lot of readers of this age will enjoy it, especially more reluctant readers. There’s not a lot I can say about the book without spoilers because of how short it is and how much of the book isn’t completely clear right up to the end. With this in mind I’ll keep my review short and sweet. 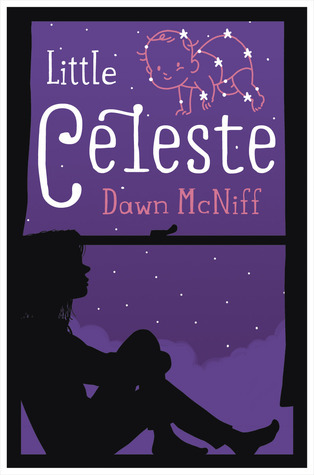 I really did enjoy Little Celeste, with its humour and great look on life and the things going on; its a great addition to any book shelf. I definitely think it will make for a good read at that age when everything is about to change so readers about to venture into high school should definitely give it a go. Little Celeste was published by Hot Key Books on April 3rd. My copy was sent from the publisher in exchange for an honest review. This looks cool, I’m trying to read more for this age range so will definitely keep an eye out. Fab review Raimy!